How do you define furniture that’s not quite antique by the traditional definition but far from new? It’s not a cut and dry determination by any means, but lots of pieces falling into this category were made during the Depression era. In furniture terms, that constitutes the late 1920s and ‘30s spilling over into the early ‘40s. Even though lots of hoity-toity antique sellers treated these pieces like ugly stepsisters just a few short years ago, Depression-era furniture is managing to hold its own these days. More and more dealers have started to notice and carry furniture made during this period. A Glut in the Marketplace? While the market isn’t quite glutted with Depression-era furniture just yet, the increase in pieces available can be attributed to more and more coming into the marketplace through estate clearings as opposed to meeting secondary market demand. But even so, demand does make up part of the equation. After all, this furniture is still affordable in most cases. It fits in with lots of different decorating looks. And, many times, has a curvy Art Deco appeal that isn’t overly ornate. In other words, the furniture itself doesn’t compete with the decorative accessories and accent pieces with which they are used. If you want to study up on this type of furniture before you head out shopping again, look for a copy of Furniture of the Depression Era by Robert W. and Harriett Swedberg for Collector Books (now out of print but available through used booksellers online). In addition to a price guide, which may or may not be accurate depending on where you’re doing your furniture hunting, this illustrated reference includes a wealth of information on dating, manufacturers, and the identification of wood veneers used during the period. 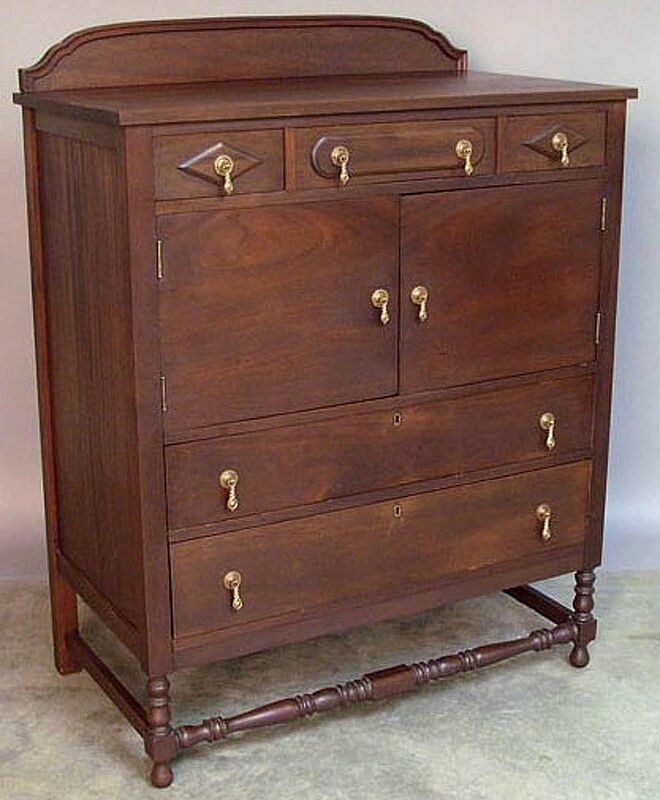 Yes, Depression-era furniture makers employed lots of veneer work in their pieces. Manufacturers had to make furniture appealing to consumers while keeping costs down during lean financial times. Layering a thin slice of attractive veneer over wood of lesser quality offered a way to accomplish this objective. As long as it is in good condition, there's nothing wrong with purchasing a piece made with veneers. However, according to the Swedbergs, actually identifying what types of woods and veneers were used during the depression era can be complicated by the fact that many different kinds of bleaches, stains, and fillers were used to change the characteristics of the wood. And many styles were copied from those popular in the 17th, 18th and 19th centuries throughout the Depression years. Some are exact replicas, which can only be identified by closely examining the woods used. Others have slightly modified characteristics that make identification somewhat easier. With that in mind, it's important to note that not all veneer furnishings are low-end. Some produced 100 years prior to the Great Depression are fine quality and highly desirable. If you think you may have an older veneer piece, let a professional take a look at it before altering it in any way. Most of the furniture we generally associate with the Depression-era has a distinct look, and some pieces in these styles are more popular than others. China and curio cabinets, many with nicely curved fronts and glass panels, seem to sell more readily than buffets used in dining rooms, for instance. People seem to want more functionality in furniture pieces today rather than larger items that just take up space. Don't forget, however, that moving a buffet into the living room and using it as a stand for a television isn't out of the question. In the bedroom, ladies enjoy owning the vanities and dressing tables with benches that were very popular during this period in furniture history. They tend to prefer those with three mirrors instead of just one since the two side mirrors can be adjusted to show the face, profile, and the back of the hair. However, pieces with large round mirrors or those with obvious Deco flair continue to be popular as well. Small accent tables, also known as occasional tables, from this time period might be the best bargain of all. Only the examples with fancy inlays and veneers in excellent condition command high prices. Look for simple-yet-functional Depression-era tables that fit in with most any decorating style. You can also change the finish on these without worrying about ruining a more valuable piece of furniture.